I’ve reproduced the bulk of a 2009 Times of India’s profile of the artist-footballer below. The brief article contains lots of information about her career as a player. “It’s time for all of us to face the truth,” she says, sifting through memories when she was queen of the 100m field and the continent, her kingdom. At a time when FIFA has struck off the Indian women’s football team from its world rankings for being out of sight or rather action for more than 18 months, Yolanda reminds us of the late seventies and early eighties when women’s football bettered the best in the continent and matched the rest of the world. “Taiwan had an exceptionally strong team and was number one in Asia, but we always gave them plenty of problems. We were so strong in our belief and quality that we took the field knowing we could get the result we desired against most of the teams in the world,” says Yolanda, voted the player of the decade in 1980 by the Women’s’ Football Federation of India. Yolanda’s story deserves to be told more so because it has the ability to instill the belief that women’s football still has the ability to enchant, entertain and inspire a generation. It may not be the case elsewhere, but at least in this part of the world, many equate football with masculinity. But, as Yolanda’s story would demonstrate, that was never the case when she got enveloped by the magic of the game at a very young age. “I would play along with my brother (Francisco) and his friends, but most of the times I was shunted to the goal. Whenever I got a chance to play up front, I would really put my best foot forward,” remembers Yolanda, who grew up to become one of Goa’s exemplary, if not, finest footballer. 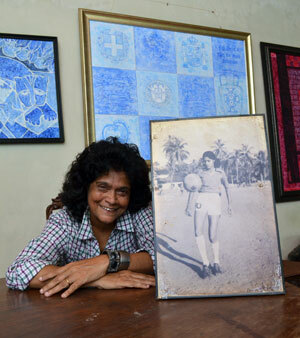 Yolanda scored a goal in the first ever recorded women’s football match, playing against a men’s team appropriately called Adam’s in 1973, but it was not until 1976 when Goa took part in their first Nationals at Sultanpur and Yolanda scored a bag full of goals – 15 in all including two hat-tricks – and announced her arrival on the big scene. “We lost in the final against Bengal by the narrowest of margins,” remembers Yolanda, dubbed the Madonna of Goan football. The 1976 Nationals at Sultanpur was the first Goa ever participated in, and for the first time got to know what other players thought about Goa and Goans. “Since the facilities were not good enough, we wanted separate accommodations. This led to rumours that we sought a hotel elsewhere because the players wanted to enjoy their drinks! They believed we played well because we were drinking,” laughs the Calangute-based artiste. Goa hosted the 3rd edition of the National football championship in 1977 and, true to expectations, won the tournament in style, defeating twice-champions Bengal 3-0 in front a lustily cheering capacity-crowd at the Bandodkar stadium at Campal. Goa dominated the championship from start to finish, scoring an amazing 49 goals that included roaring wins over Madhya Pradesh (25-0), Punjab (10-0), Gujarat (5-0), Manipur (6-0) and, finally, Bengal (3-0). Goa’s deadly strike pair of Succorinha Pereira (19 goals) and Yolanda (18 goals) scored 37 of the 49 goals, but often it was such a bore to score goals against the hapless opposition that even the strikers played the ball amongst themselves instead of taking aim at the goal! “We were too strong for the other teams during Nationals. We used to score early in all the games since most of the goalkeepers remained clueless,” says the stylish striker. Yolanda’s international debut came in 1976 when she, along with the likes of Rekha Karapurkar, Succorinha Pereira and Helen Fernandes, found a place in the Indian team against the visiting Swedish club BET. She set all the venues on fire, ensuring seven victories and in the process becoming the first woman to score a hat-trick for India. Since that memorable debut, Yolanda remained a permanent member of the Indian team until she was forced into premature retirement after the World Cup of 1981. “Injury cut short my career. I was too scared to undergo an operation to correct the damage and instead opted to call it a day,” says Yolanda, who gave up hockey and badminton which she excelled at the highest level to nurse her football dream. The artist with a photo from her playing days.